The Affordable Health Care Act (aka ObamaCare) is wreaking havoc on small businesses, and especially solo practitioners. Here is an excellent video on the issue by Seattle-based NBC affiliate KING TV. Insurance companies are making changes to their current programs to react to ObamaCare in January of 2014. They are ditching plans and programs they had in place, which were perfectly fine for many. Now those policies will not be around anymore, throwing thousands of people into a quandary of what to do. The options are bad – higher premiums, higher deductibles, and less coverage. Health care has small business owners and entrepreneurs scrambling. The end of the year is coming up quickly and many problems need to be resolved. Unfortunately, too many politicians are using health care in a tug of war with you in the middle. The best thing you can do is continue to stay informed and keep your options open. Stay tuned and hang on! 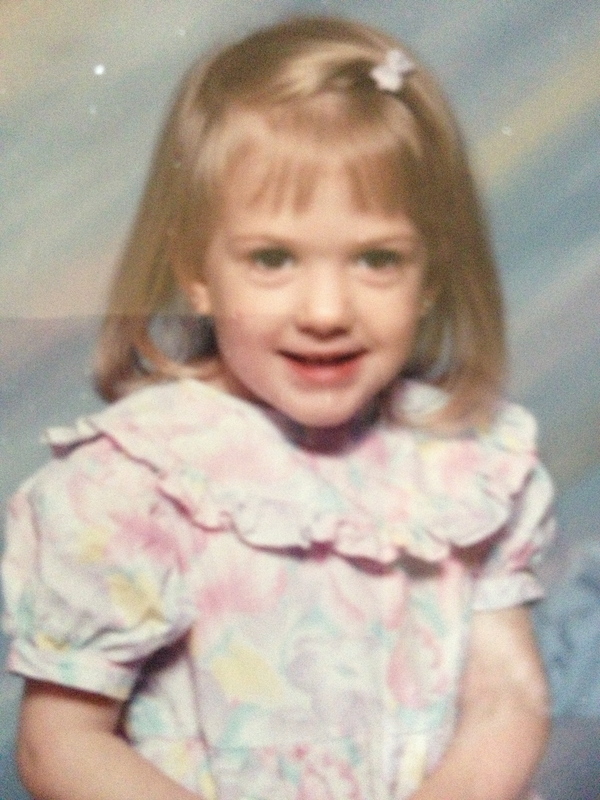 My daughter turns 25 years old tomorrow. A quarter of a century. That seems completely and utterly unfathomable to me. Heck, when she was born, Barb and I weren’t even that old! I remember this day 25 years ago like it was yesterday. Mindy decided to come a couple weeks early and we had to rush to the hospital early on the 28th. Then (as many a baby does) she changed her mind. The 28th (which we assumed was going to be her birthday that morning) soon drifted into the next day. This was okay because we hadn’t thought of a name for a girl yet! We had the boy’s name from the beginning, but had not come to an agreement on a girl. We didn’t know in advance, so we were hanging on a 50-50 proposition. One hour before she arrived on the scene, we ended up making a decision, just in case it was a girl. As it turns out we chose Melinda (Mindy) and we were glad we could call her by her name right away! Sometimes you just have to make a decision. The opportunity is either thrust at you (we thought we had more time) or you enter a place where harm to yourself or others is at stake (the federal government shutdown). You can’t delay action and decisions because you’re scared to make the wrong one. The majority of our decisions are not life and death, and if we make the wrong one, it can be fixed. More often than not, waiting makes it worse and causes more damage than if you made the wrong choice! Waiting around is dysfunctional. Be bold. Be decisive. Take into account the information you have in front of you and make a decision. Then commit to it and move forward. You just might have a girl! On Saturday, Barb and I joined her new friends from the ferry to make apple cider. It was a perfect Autumn day – cold, crisp, and bright. The cider making was at the home of the husband and wife combination that have really pulled this group of commuters together (you may recall from a few Extra Points ago). The man’s name is Chuck, but he affectionately is dubbed “The Podfather,” after the name of the group (The Pod). The Podfather and his wife Deborah made sure that the 20+ people who came (including children) were greeted, given instructions, fed, and given a tour. 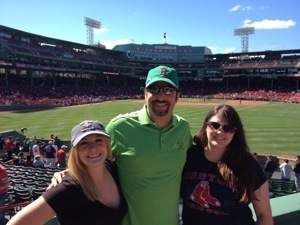 The Podfather and Deborah were perfect hosts. They ensured that all guests were well taken care of and had a good time. How hospitable are you in your business? Sure, you are probably very cordial and kind to people you come into contact with on a daily basis, including customers, prospects, and employees. But there are many ways that I’ve seen where business professionals are inhospitable without really thinking about it. Do you recognize yourself or your business in any of these – Don’t return phone calls or emails within 24 hours. Make leaving a voice mail painful and grueling (i.e. requiring your caller to punch 7 different numbers on an automated line that disconnects in the end). Show up late to meetings without calling. Don’t offer electronic voice mail as an option on your direct line or mobile device. Employ receptionists without basic skills required for the job (e.g. a personality). These are just a few examples and all that I’ve encountered in the past 30 days. I’m sure you have, too. Technology has for some inexplicable reason made humans more lax in basic “hospitality” skills when it comes to business. It actually should have the opposite effect, yet professionalism has seemed to decline, making those that do these things stand out like a sore thumb…in a positive way. Take a cue from the Podfather and Wife…make your business associates the most important guests you have and treat them that way all the time. They just may reward you with their continued business and support! Last Sunday, my hometown Seahawks had an uncharacteristic breakdown on the final play of the first half, which nearly cost them a game. They lined up with 2 seconds left to kick a chip shot field goal and increase their 7-3 lead over the Tennessee Titans. This is about as routine a play in the game as there is, as it’s akin to kicking an Extra Point. There was, however, one major problem. Earlier in the quarter, the Seahawks kicker Steven Hauschka was injured making a tackle (or literally getting run over). He had to be taken into the locker room to be examined. NFL teams (unlike in college) don’t have the flexibility of carrying backup kickers on their limited roster. For the Hawks, the duty went to punter Jon Ryan. The Seahawks did a decent job of getting the ball as close as possible for Ryan to attempt his first ever NFL field goal. As the snap came back, backup holder (and defensive back) Chris Maragos mishandled the low snap, tried to pick it up and run, and in a scene straight out of the Keystone Cops, fumbled the ball forward. The ball was scooped up by a Titans player who raced 90 yards to the end zone for an unbelievable touchdown to take the lead at halftime. 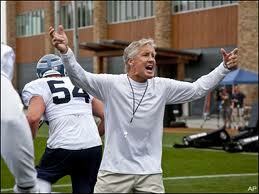 The Century Link crowd, the Seahawks, and their coach Pete Carroll were stunned. Fortunately for the home team, they overcame that adversity and pulled out a win. After the game in his press conference, Carroll took the blame. He admitted in retrospect that the decision to put his players in a position to fail was “egregious.” They had not had enough practice time and it was set up for a disaster. In hindsight, he would have simply gone for the touchdown with 2 seconds left. As a crisis management expert, I look at this play as a microcosm of business (much easier to accomplish because the Seahawks won the game). Carroll did the right thing with his mea culpa and taking responsibility. The interesting thing is a similar situation occurred in a playoff game last year against the Washington Redskins. Even though a kicker getting hurt is pretty unlikely, the need to be completely ready and prepared remains. 1. NFL teams are always prepared for an injury to their most important player, the quarterback. The likelihood and significance is greater than the kicker. The backup (redundancy) is always ready to go. Business is the same way. You are ready for that fire, windstorm, or earthquake. However, how ready are you for the minor “injury” that could cost you big time? Your injured kicker might be an intruder due to lack of security; a wet floor in the office cafeteria just waiting for someone to slip; or an inefficiency in the production line that sends out a defective product. Are you too focused on the big picture and overlooking the other perils? 2. To make a field goal or extra point in an NFL game, you must have three things work well – the snap, the hold, and the kick. Any one of those things that goes awry will create a problem. The Hawks had a backup plan. They had their punter Jon Ryan ready to kick. Unfortunately, Ryan is the regular holder. Maragos probably takes under 5 snaps a week in practice to prepare for this. The snap was low and mishandled. You undoubtedly have processes that require precision and consistency. What happens if your redundancy isn’t prepared to deal with less than perfect conditions? Are your backups ready to handle a low snap? 3. Can you bounce back? The Seahawks regrouped and were able to respond to adversity. Why? I can’t say with certainty as I wasn’t involved with the play other than screaming from my living room. What I can imagine is that Carroll, as any good CEO or President, took the blame, remained calm, trusted in his management (coaches) and employees (team) and stayed on the plan. What’s your plan in crisis? Do you have one? Is it written, communicated, and practiced? How can you move forward without one? 4. Timing is everything. This calamity happened with a whole second half to play. If it had been the final play of the game, all would have been lost. What if your crisis falls in it’s worst time. For the Seahawks, they lose a game (which in their business is crucial). For you, you might lose your business. You’re in the “what if” business as an executive. This is a strategy decision. Like Carroll, it’s your responsibility to make sure all the “what ifs” have answers that are clearly communicated and implemented. In the end, you’re the one that faces your board of directors, employees, customers, media, community, and your family. Decision making is always a hot topic when discussing leadership. Yes, there are many factors that go into making strategic decisions, but I would wager that over 95% of decisions we make every day as a business professional/executive and as a person can be made swiftly and simply. We just make it harder than it needs to be. 1. Will you be better off? Will you be happier, smarter, richer, better looking, thinner, have more hair, or take strokes off your golf game? Whatever the result you want, are you better off? If this is a hard question to answer after about 60 seconds of pondering, then you simply don’t have enough information to continue going on. Note – this isn’t about ROI (yet). It is a simple yes or no question. Will your condition be improved? 3. Do I believe it? Is the Return on Investment real to you? Do you believe in it? This involves trust and experience in the person or organization you’re dealing with. It means that the person, service, or product has sufficient credibility for you. Not only will you be better off, but you will be exponentially better off. If I asked you to invest $100 with me and I promised you a 10 to 1 return of $1,000 in 6 months, the only way you would do that is if you had full confidence in me, my process, my product, and/or my word. I would have to be credible and you would have to believe in me. The biggest fear that decision makers have is they will make a wrong decision. Memo…there are no guarantees in life except for taxes (even when the government is closed because they can take your money, they just can’t write you a check) and death. If you allow fear to paralyze you through the self editing and the over thinking process, the delay or lack of action have greater consequences. Don’t make decision making harder than it needs to be. Look at my 3 steps and understand that in nearly 100% of the decisions you will make today and in the future, this process will serve you well. It doesn’t guarantee that the decision is right (that’s what hindsight is for), but it will allow you to move forward. Last Sunday night about 11:30 pm, I found myself in Penn Station in New York trying to catch a subway train to Columbus Circle to get to my hotel. The directions I was given was to take the A train, but it turned out the A train doesn’t run on Sundays. The signage of what to do is poor for those of us who are neophytes in the process. I was tired from traveling all day and desperately wanted to get out of there. As I stood in the station, I asked a young lady for help. She surveyed me and must have deemed that I was okay and said in a Russian accent, “You need the C train. Follow me.” We went up an elevator to the next floor, and she pointed to the track we were now on. “The C train will stop here and you will be two stops away.” The train came soon after and we both got on. As we passed the station before my stop, she said to me, “The next one.” As we arrived to Columbus Circle, I noticed she also got off at the same time. Turns out she was so confident in part because we were headed in the same direction. Sometimes, you just have to trust. People play key parts in our lives if we allow them to help us. We just have to ask and trust. I could have chosen to try to figure it out on my own and probably wasted time, got lost, and become even more frustrated. I’m glad I asked for help. I’m sure I will never see my Russian friend again, but at that time and place, she was my guardian angel. There are times in your life…maybe even today…when you need to ask for help. There’s nothing wrong with that; we all have to do that sometimes. You just might find that with a little trust in the right person, you will find your way, too. Sometimes you just need a little help. I’ve been getting better at traversing the New York subway and rail system. I know where I’m supposed to be and when, but not always sure how to get there. On my brief trip from my hotel to the subway to Penn Station to catch the NJ Transit, I needed help 4 times. Just to keep me pointed in the right direction and on the right train. Contrary to popular belief, New Yorkers are nice and helpful. As I type this blog on my phone on the right train, I’m thankful for their guidance. Sort of like business. We may know where we’re supposed to be at some point in the future, but may need help getting there (especially when your uncertain what direction the train you’re on is really going). The smartest and most successful business professionals and leaders get help through mentoring and coaching to keep them on track and moving forward. What about you? Oops. I have to do a mea culpa. The NY Athletic Club is NOT where the Heisman Trophy was born. I got it mixed up with the Downtown Athletic Club, which apparently has been torn down. I got all excited when I saw the promotional event in the lobby. Good thing I’m not a researcher by trade! Terrific time last night hanging around Grand Central Station. We ate dinner on the mezzanine overlooking the hustling and bustling of thousands of travelers heading home. Back there today for my meeting. Hoping I remember to drop by the market to pick up a spice we love to cook with! 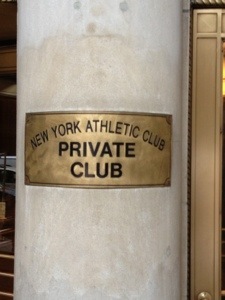 I’m staying at the historic New York Athletic Club on my trip into the Big Apple. Part if its history involves college football. The New York Athletic Club is where the annual event honoring the best college football player that year is held. The Heisman Trophy is awarded and all of college football royalty is in attendance. I saw a sign promoting an event later this month at the club with past Heisman recipients to raise money for the Ronald McDonald charities. That would be fun to go to! The club is directly across the street from Central Park. It’s a little drizzly today to take a jaunt and tomorrow is supposed to be better, so I will wait until then. Just came back from a delicious lunch with a friend near Times Square and now time to relax a little. One of the joys of business traveling is experiencing the soul of a city. That means taking in the sights, eating the food, and mixing with people. This morning, I shared stories over coffee with other travelers on their way to South Africa from Calgary to judge an international dance contest and then go on safari. Ironically, we were in a Starbucks in the rain! 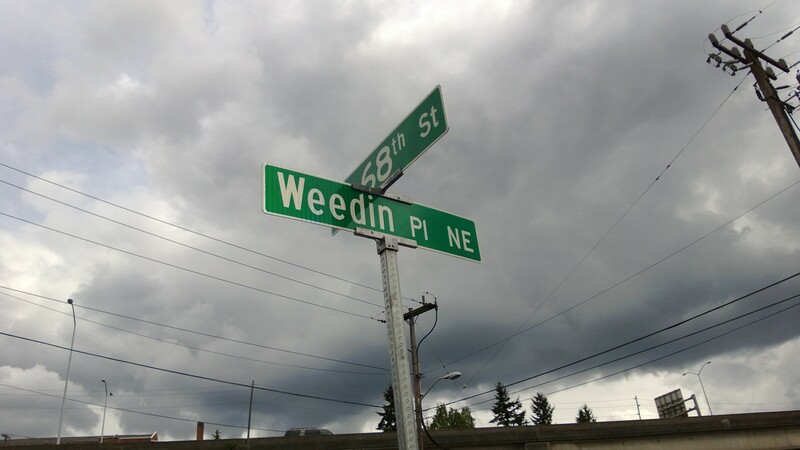 Ironic for me because that is normal in Seattle! Bottom line – enjoy where you are and be bold in discovering and trying. You never know if and when you will cross that path again.